Finally found some "me" Time to be able to get a card done. I have lost my mojo at the moment i seem to be out of practice making cards etc . which is really frustrating, I don't know why but i don't feel as excited about crafting lately but hopefully that will improve with the more i start getting back into my crafting. First thing first is to finish the new blog make over I'm doing on here, and then move my blog over to a different address. Here is my card i done for the Sugar Bowl. Below is my Card i have done following the Sketch above. I really enjoyed making this card once i got over the frustration of not remembering techniques and feeling like i was starting from sketch as a newbie crafter lol. I used a mixture of matting and layering, along with Embossing and Distressing with Inks. 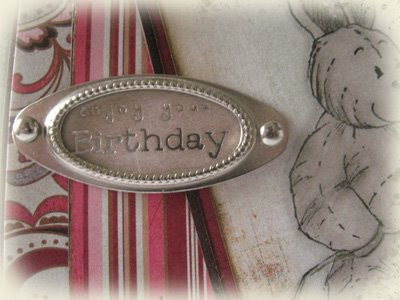 This entry was posted on 10.1.09 and is filed under Basic Grey Papers , Handstamped Cards , Stampin Up , Sugar Nellie Stamps (Sold at Funkykits) . You can follow any responses to this entry through the RSS 2.0 feed. You can leave a response, or trackback from your own site. this card is sooo gorgeous! 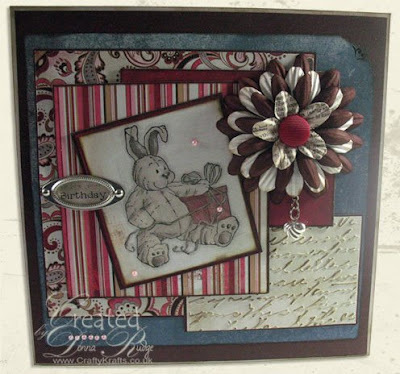 What a gorgeously sweet card! Glad to have you back crafting, where you love being! Thanks so much for joining the first challenge from The Sugar Bowl!